I really don't cook a lot for myself. I don't plan my meals, I don't have a blog calendar or editorial schedule either. The plan and lure of blogging, for me, is the spur of the moment fun things I put together when I'm just kidding around. Or am really hungry. Despite the name of my blog, there are no snacks on this blog. Okay, there's one. I mean, two. When I am home alone, I tend to piece small amounts of things together to make a series of snacks to eat throughout the day. One of the results is this taco. I love tacos. 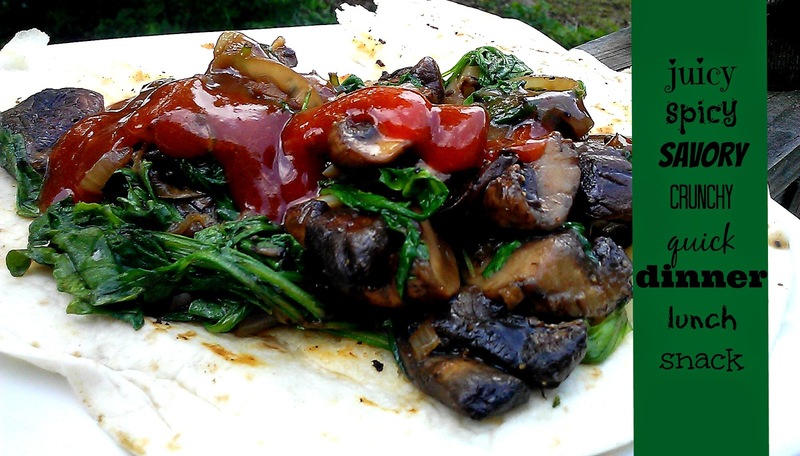 Give me a tortilla and I'll stuff it with whatever I can find, make a sauce and eat it. I eat tacos a lot. Tacos, homemade hot pockets, stuffed pancakes, pizza and salads are my thing. After posting this pic to Instagram and Facebook, I was instantly bombarded with requests for the recipe. Here you go. You're welcome. Heat 1 Tablespoon olive oil in a large skillet over medium heat. Add 10 to 15 oz of sliced crimini (baby bella) mushrooms and add 1 large sliced shallot (or small red onion) onion and 3 cloves of sliced garlic to the pan and cook until soft, about 8 minutes. Sprinkle in 2 tsp salt and a couple of pinches of black pepper and cook until mushrooms begin to soften. Pour in 1/2 cup tomato sauce, 1 tsp red pepper flakes, 1/4 cup leftover gravy*. Simmer until liquid is thickens up a little. Add large handful of fresh, washed arugula, stir and cook until wilted, about one minute. Season with more black pepper. Sprinkle with a palmful of shredded Parmesan cheese. Heat flour tortillas in the microwave for 15 seconds, just to soften. Serve immediately. *I used gravy I had leftover from a couple of nights ago. You can get gravy in a jar from the store, if you so choose. Otherwise, take some vegetable or chicken broth and thicken it with 1 or two tablespoons of flour or cornstarch. Mix the flour (or cornstarch) with a little bit of the broth in a separate cup so when you put it in the broth to make the gravy, you won't get lumps. Stir it with a whisk to make sure you don't get lumps as you cook it. Bring it barely to a boil to cook out the raw flour/cornstarch taste. Season with additional salt and pepper, to taste. Mmmm, This taco looks great! Packed with lots of mushrooms just the way I like it! 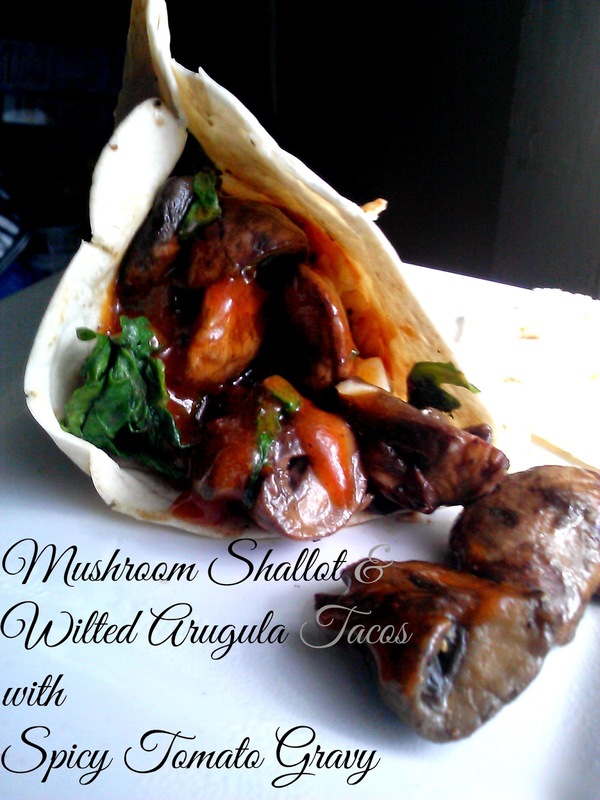 I love arugula and with all those veggies that's my kind of taco! Now this is a taco I can dig into! wow, these are ingredients I would never think to put in a taco. Great job on being inventive. 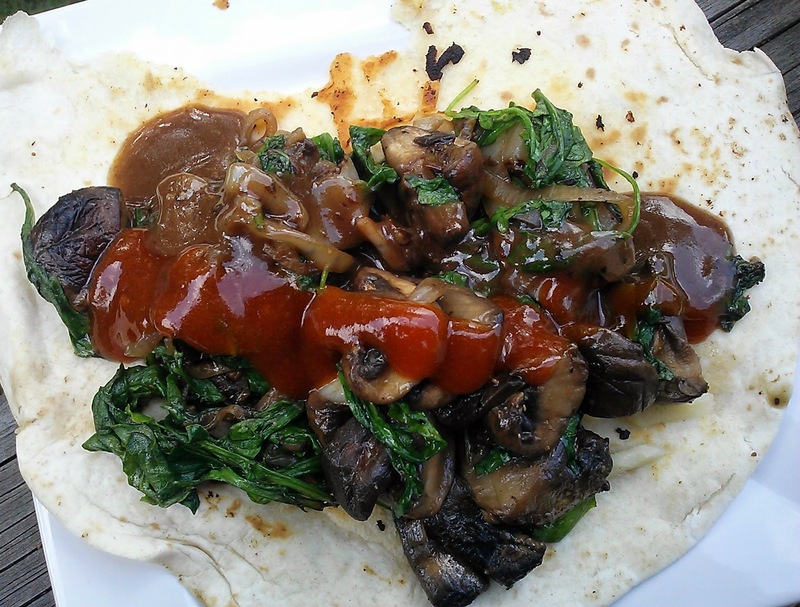 Gosh I love spicy mushroom tacos though I never had it with tomato sauce! These tacos sound delicious. Love the mushrooms!